Getting my Santa Fe ready for Towing… and tweaked. 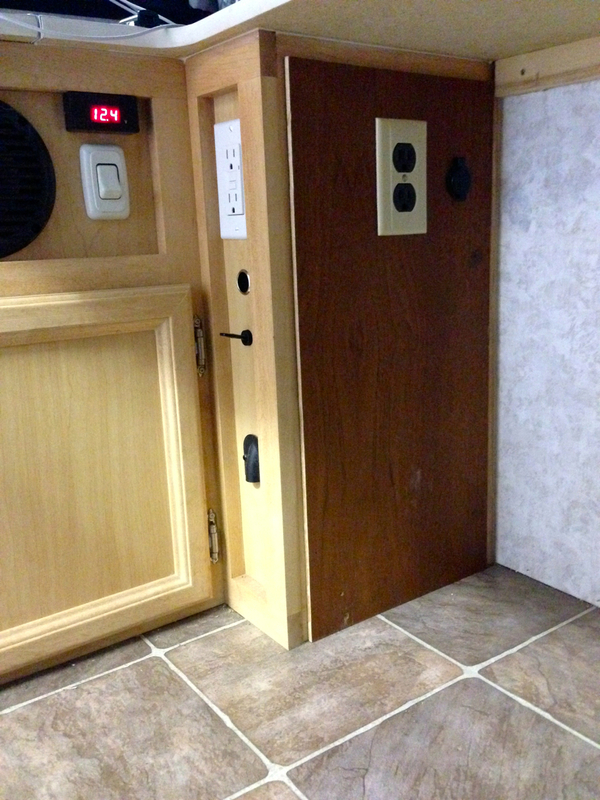 In preparation for the addition of permanent AC power and also to gain a bit more room to store the Porta-Potty I replaced the door that is used to gain access to under the sink with a piece of panelling held in place by magnetic latches. This allowed for a flat space, without a door handle taking up space. The inverter was a bit larger than expected and the installation instructions nixed the planned vertical mounting. After trying this and that I decided to steal a bit more space right next to the batteries. 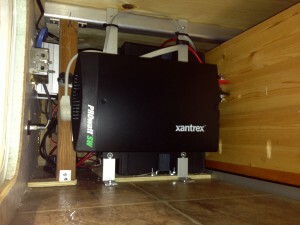 I decided on the 1000 watt Xantrex PROwatt SW even though 600 watts would have been ample. The cost difference was minimal and size was almost the same. I picked the PROwatt series because it supplies true sine wave power and remote on/off and transfer switch was readily available. The 2 6 volt AGM’s are mounted side by side on end provide 225 AH of 12 Volt cabin power. 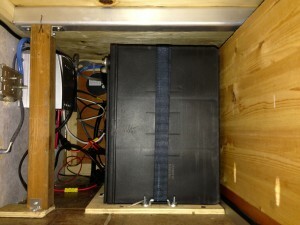 Behind the 1 1/2 square upright is the Solar controller. Mounting it on the side took minimum floor space. The remote on/off is mounted in the cabin area. The inverter supplies a brown duplex outlet under the sink/table area via and automatic transfer switch. The brown duplex outlet is to differentiate from the hydro only outlet. When hydro is available the brown outlet is powered by hydro and when no hydro available and inverter is powered up we have 1000 watts available from battery/inverter. Primary usage will be power for laptop(s) and for a 200 watt electric heater. 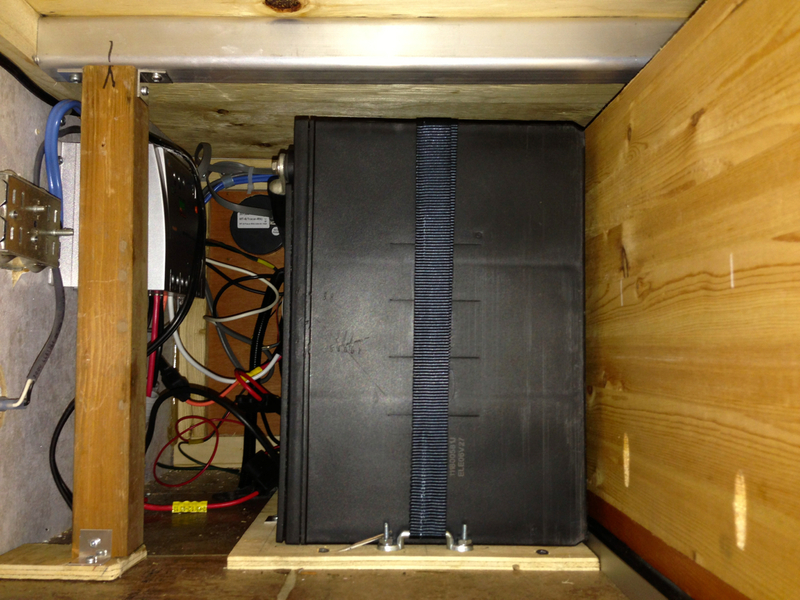 The transfer switch is mounted on the sidewall near the converter. Power from inverter is supplied via a heavy extension cord. An extra breaker was added for the AC side. 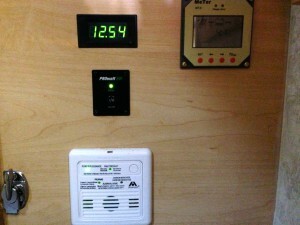 The electrical corner in the cabin consists of Carbon Monoxide indicator, which was original equipment, near the floor. The 12.54 is a combination volt/ammeter connected directly to the battery. 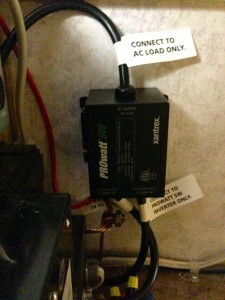 Below that is the Xantrex inverter remote on/off switch. In the top right corner is the remote for the solar controller which tells us if/when batteries are receiving a charge from the solar panels. It also allows us to turn the load terminal on/off remotely. Connected to the load terminal of the solar controller is the 12 volt supply for the Engel fridge in the tow vehicle. On my Suite (factory stock) doesa plugging into shore power charge the trailer battery? It will also charge from vehicle if your tow vehicle plug is wired as per ProLite recommendations. Pin 4 carries 12V power. Pin 7 could/should, but the wire used for pin 7 was not used in the trailer, it was cut in mine in the junction box. Trailer battery will charge via pin 4 while engine is running. Subaru wired my 7 pin setup per industry standard so I assume will charge while towing. Nice to be able to charge at home though with extention cord to house without putting battery charger on! 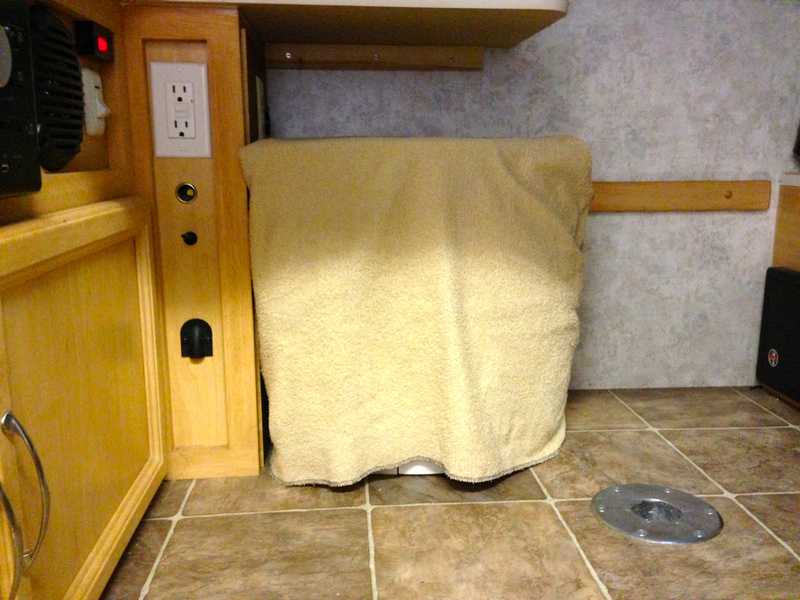 Heinz, I bought a 20′ 12V extention cord from CTC. Package didn’t say what gauge wire it is, hope it will be adequate! See what it looks like when you get it. You could also measure voltage at both ends with fridge running. An easy breakout is one the short 1 to 2 adapters and then you can use a DC voltmeter to see what the drop is. Be sure that fridge is actually running when you test it. Test it on battery only, I.e. shore power unplugged. Ok…I already have a 1>2 breakout so should be easy to test. Is there a minimum acceptable level and below that will damage the fridge? I thought I read something like that somewhere! Look in the fridge documentation for minimum. I use 11.7 as min but that’s just me and has some safety margin. The trick is to measure with and without extension. There should be no drop, Ideally, but I would expect a few tenth maybe. Another downside of too small is that it will generate heat. Package does say outlet will be hot during use. Total draw of all accessories must be less than 5 amps. Check manufacturer’s specs for proper voltage. Since you’re only going to draw 2.5 amps or so it may be good as is but I would check voltage drop and base your decision on that for long term use. (Truckfridge) into 1>2 splitter plugged into my external 12V port and measuring voltage on the open splitter end. Voltage readings flicker around but ranged from 12.3>13.3V. I then plugged splitter and Fridge into 20′ extention with extention into external 12V port and again checked voltage across open splitter. This time range was lowest flicker of 11.3> high 13.3, with most between 12&13 V. Did I do this right? 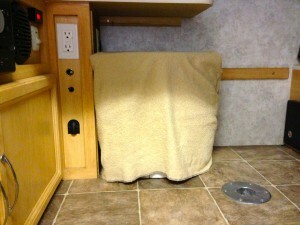 Heinz, should I leave the trailer plugged into shore power all the time at home? Are you using a digital or needle type of volt meter? It should not be “flickering” that much but if needle it may hard to tell. 11.3 kinda low, I think. Again, why so much flicker. I’ll try and do some testing on mine first change I get. Mine is plugged in all the time at home. Occasionally I unplug it for a day or so, keeping an eye on battery voltage. I have a Fluke digital meter, and I had just started up the fridge. probably due to varying continuity with holding one probe in centre while trying to make contact along inside edge with opposite polarity probe? If you have something that has a 12V plug that you no longer use, cut it off and make a good end to better simulate what the fridge ‘sees’. Fluke is reading to 2 decimal places. Don’t know if I have anything…not much of a 12 V user in the past but will look around. Hoping to get away for an overnight boondock next weekend so will use fridge in TV and then use 20’extention from trailer at the site and see how it goes. Fridge has low voltage protection anyway I think.If the cord seems sketchy, I will just move the fridge to the trailer. Any old 12V plug should do. I.e. Old cellphone adapter, etc. Heinz, today I bought the 12V plug ends at Napa Autoparts and one of our electricians made me up a 12 ft extention using heavier gauge wire so I should be OK now!? Assuming #10 or better wire was used you should be in good shape. It’s AWG 16 stranded 3 wire, the electrician said #10 would be HUGE! The cable you bought is probably #16 or #18, 18 being the smaller size. But the 12 footer being shorter will be better. I like spares and I like oversizing capacity so lets just say I would’ve built the extension using #12 or #10 cab tire, which is what I did for mine using #10. If it ends up feeling warm during use, check for voltage drop. If marginal your fridge will be operating at the cut-off. Not recommended. BTW…Indel B fridge worked great, I had it set for 3 C and it held 3-4 C the whole time. But I think that setting is a bit too low since it froze my wife’s Gatorade drink bottle, so next time will try few degrees warmer set point? Yeah, a bit of a crapshoot to get the setting right. I use a wireless remote thermometer, leaving the transmitter in the fridge and receiver in trailer. I shoot for about 38-40F. Glad the campout worked well. Hope you get many more as summer progresses. A bit off topic… Boiler replacement !!! Dale Goodwin on Any Aliner Ascape owners out there?